I was walking from the barn up to the house after tucking in the sheep, looking at the ground as I walked, lost in my thoughts of this photo and what I should say about it. Something about how I never know what I'm going to find when I step outside each morning, as I saw this little critter two mornings in a row, happily scampering about in the llama pen adjacent to the barnyard. The second time was when we (me, Cary, Bear, and Robin) all went in for the close-up photo. I want to say this is a baby skunk, as I have seen much bigger ones, but I don't know for sure. Perhaps it is simply a smaller variety. It immediately took notice of us and started hopping around, its tail pointing straight up, but it didn't spray. It really is cute. So there I was, face to the ground, carefully watching where I was walking (the terrain is uneven, plus we have snakes), my mind on the little skunk, when something over by the creekbed caught my eye. I looked up to see two spotted fawns bouncing right toward me. They seemed airborne--I think I saw maybe three hooves total actually touch the ground. Their gangly legs moved in all directions at once, their speed surprising. I fumbled for my camera but Bear spotted them before I could get it out. In a whirl of tan and white they were gone. I stood there blinking, wondering if I had actually seen them at all. And then I realized that I never know what I'm going to find when I step outside--not just in the morning, but any time of day. Aaaaack! Run for your lives! Run away, little Cary and DDD! How on earth did you capture this pic, FG? I take it our smelly friend was far away, and you have a telephoto lens. Okay, now I am in love with a skunk. Thanks to you I fell in love with a donkey and now a skunk. Look at his or her cute face. Adorable. Too bad they are so stinky! How adorable! What a fantastic shot! Skunks are so cool, and they eat all your nasty grubs. They rarely spray unless provoked. Maybe you even have little skunk babies around somewhere! Awww... too cute! OMG -- is that skunk doing what it looks like? Darn, how can they look so cute and be so smelly at the same time? You have some really great photos on your blog. I will be back to visit. OMG, so glad I read your response to the comments. I was envisioning you soaking Cary in tomato juice to remove stink (is that a true remedy?) or worse yet -- shearing her! Oh my...I thought I sniffed a skunk this morning. Since I'm 300+ miles south of you, it's probably not the same one...on second thought, the wind was from the north today. Skunks are amazing creatures.. some people even have them as pets! (with odor glands removed of course) .. there are several on the property where I sometimes work in Hunt... they won't do any harm unless provoked and they give advanced warnings -- several. I think they are beautiful -- even if they do smell bad when they spray. Even thought they are cute, and other poster have said that they don't spray not unless provoked, I still don't like them....hate it when I'm out pulling a calf, in the barn at 4 in the morning and out pops a skunk. That and we've had problems with them carrying rabies. Yep, they are cute alright, but why is his tail in the position of getting ready to spray :) A old friend of mine had a skunk on her front lawn with a can stuck on his/her head. My friend went up and took it off and the skunk just went away. It must of known she was helping her. One last question?? Don't skunks usually come out at night? Not in the day? He is a real cutie...but I thought they were mostly only out at night too...which makes me hope there's not something wrong with him as in rabies. Here's looking at the glass half full and that maybe it's a momma with a needed break from her kits. Love the picture, I could see myself trying to find a way to pet it and not get sprayed. Oooohhh, he's so cute! I could cuddle him although he stinks (I wonder how foul it smells as those animals don't exist here);-)!!! How adorable because it didn't spray !!!! Do you know the Cartoon, Pépé the Skunk ? It's so funny. Do you have rabbits hopping around your ankles and birds landing on your arms, singing songs with you!?! And I think skunks are cute! We had some coming around our house when we lived out in the country near Dayton, OH. Mom got upset when she caught my brother and I sneaking outside in the dark, hand feeding them Oreos. I believe skunk stink and rabies were the two issues at hand? Hello! How else are they going to get that color if you don't feed them Oreos!? I love the early mornings too. I like to take my camera and mug of coffee outdoors and quietly walk arond the property and see what critters I can surprise as they go about their morning routine. As I raised the kitchen blind the other morning, I surprised a young coyote right outside, this time I did not have my camera anywhere handy, I would not have had time to snap a picture as he glanced at me then quickly ran off into the bushes.He sure was beautiful. I think he looks like a baby too. Cute little guy. Yeah, they smell but have you smelled a teenage boy's room after a sleep over? What a great post. If I get this much joy from reading them goodness knows what it's like for you LIVING them. Thanks FG. I'm new here, but you can be sure that I will be back. Love the skunk picture, good thing you had your camea handy. Any chance of getting the oatmeal bread recipe? He/She's so cute! 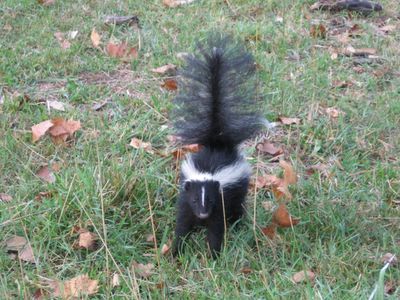 I know they're stinky and all that, but I find skunks absolutely adorable. There's quite a few around the place where I work, but I've never gotten quite as close up of a view as that! he(or she) is just too cute ! !